On the Andaman Islands, located between the Bay of Bengal and the Andaman Sea, at about 10/13 degrees north latitude, the climate is tropical, hot all year round, with a dry season from January to April, and a rainy season due to the Indian monsoon, from May to November. The temperatures are stable throughout the year, however, before the rainy season, in March and April, the hottest time of the year occurs. Here are the average temperatures in Port Blair, the capital, located on the island of South Andaman. Precipitation is abundant, and amounts to almost 3,000 millimeters (120 inches) per year; they begin in May, and are very frequent. The rains decrease in November, and in December they are already quite rare. Here is the average precipitation. From December to April the sun regularly shines, while from June to September the sky is often cloudy. The sea is warm enough to swim in all year round, as can be seen in the following table. 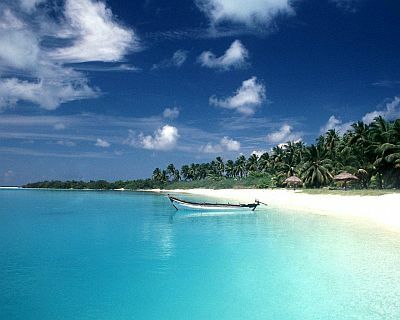 The best time for a beach holiday in the Andamans is from January to April, since it is the least rainy of the year. Sometimes, the rains last until mid-January, while in March and April it can be very hot; moreover, in April the first cyclones can affect the islands. Therefore, the best period is from mid-January to the end of February. All year round, bring light clothes of natural fibers, a sun hat, a scarf for the breeze, a light sweatshirt for the evening. In the rainy season, you can add a light raincoat or umbrella.